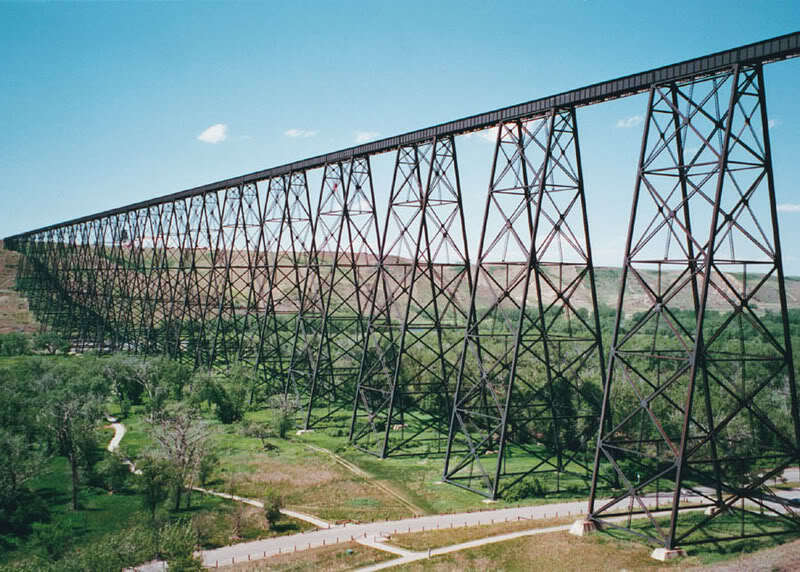 The Lethbridge Viaduct is the highest and longest steel railway bridge of its type in the world, spanning 1.6 kilometres across the steep banks of the Oldman River, rising 314 feet from the river bed and extending 5,327 feet in length. The design chosen was a steel viaduct of 44 plate girder spans 67 ft. 1 in. long, 22 plate girder spans 98 ft. 10 in. and one riveted deck lattice truss span 167 ft. long, all supported on 33 braced, riveted steel towers. The main spans were constructed using a large erection traveler. Work commenced in 1906 and was completed in 1909. Survey work was under the direction of F.M. Young. The original design concept was by John Edward Schwitzer and the final design of the bridge was by C.N. Monsarrat of Montreal. The consulting engineer was C.C. Schneider of Philadelphia.